President Vladimir Putin said on Monday that Russia would stop construction of the South Stream gas pipeline, shelving a strategically important project that Moscow was counting on to cement its influence in south-eastern Europe. 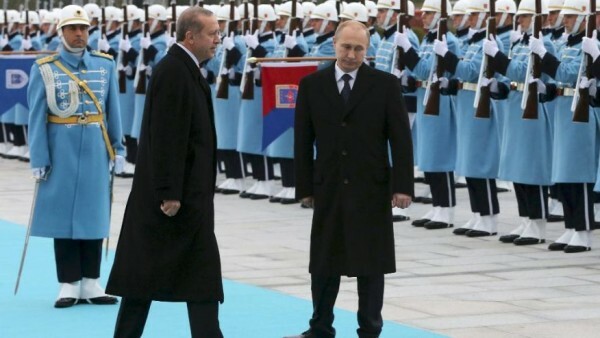 Speaking after talks with President Recep Tayyip Erdogan, his Turkish counterpart, in Ankara, Mr Putin said Russia would abandon the project to bring Russian gas to Bulgaria under the Black Sea, bypassing Ukraine, unless the EU dropped its opposition. The European Commission has refused to give Gazprom the exemption it would need to operate the pipeline at full capacity, viewing it as a potential further tool for the Kremlin to exert economic control over southern and eastern Europe. Mr Putin said that Moscow would look instead at developing a gas hub to southern Europe via Turkey. The move came on a day when the continued slide in the price of oil sent the rouble tumbling against the dollar. Mr Putin was speaking during a state visit to Turkey intended to demonstrate the range and depth of Russian-Turkish economic ties at a time when the EU and US have imposed sanctions on Moscow. His comments are the clearest admission so far from Moscow that the controversial pipeline is set to be scrapped, with government officials and Gazprom executives until now insisting that construction on the offshore section of the project was due to begin within months. Russia had argued that the South Stream project would help circumvent Ukraine and so reduce the risk of disruptions to the supply of Russian gas to Europe because of disputes between Moscow and Kiev, as happened in 2006 and 2009. But Brussels asked the Bulgarian government to cease work on the pipeline because it deemed it to violate the bloc’s competition rules. In addition to the lack of approval from Brussels, the project has also struggled to raise financing for the €14bn offshore section of the pipeline due to western sanctions on Russia that have made European banks cautious about lending to a Gazprom-led consortium. The South Stream move comes as Russia is working furiously to build the infrastructure to sell its gas to other markets, especially China. Mr Putin said Turkey would receive a 6 per cent price cut on Russian gas from January 1 and that Russian supplies would also increase. His move is set to consolidate Russia’s role as Turkey’s leading gas supplier even as the EU and US maintain sanctions on Moscow over its conduct in Ukraine. Far from following the lead from Washington and Brussels in adopting such measures, Ankara has won Mr Putin’s praise for seeking to take advantage of the sanctions to increase its own exports. Last week, the Turkish agriculture minister celebrated what he said was a more than fivefold increase in poultry and seafood exports to Russia for the first nine months of the year, while the country’s energy minister travelled to Moscow to seek lower prices for the natural gas that makes Russia Turkey’s biggest source of imports. Big differences on foreign policy – notably on Syria – have not prevented the closer economic co-operation between the two countries. “When dealing with each other, Putin and Erdogan are very calculating leaders and they don’t let emotional issues get between them, in contrast with how they interact with other leaders,” said Soli Ozel at Kadir Has University in Istanbul. Have you seen the ‘angst’ doing on already ?? Takes a lot of ‘protesters’ to change a Russian mind ….